The 504-acre Burton D. and Margaret Clark Morgan Preserve, the newest addition to the Portage Park District, was officially dedicated in a ceremony Oct. 8 at the Shalersville Township property. 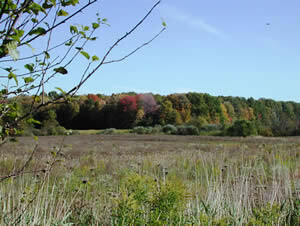 The preserve, which contains wetlands and forests, was created when The Burton D. Morgan Foundation and The Margaret Clark Morgan Foundation worked with Western Reserve Land Conservancy to preserve the land for the park district. It is now the district’s largest park. 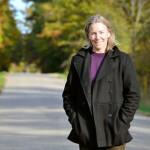 Christine Craycroft, the park district’s executive director, said now that the land has been preserved, the focus will shift to finding the funds needed to make the preserve accessible to the public. She said the preserve will be a passive park used for hiking, birding and educational programs. The park district recently received a $47,000 grant from the Ohio EPA for stream and wetlands restoration on the property next year. Craycroft was one several speakers at today’s ceremony, which was held at the preserve near the corner of Nicodemus Road and state Route 44 in Shalersville. Others included Deborah D. Hoover, president and CEO of The Burton D. Morgan Foundation; Rick Kellar, president of The Margaret Clark Morgan Foundation; and Rich Cochran, president and CEO of the Western Reserve Land Conservancy. More than 20 years ago, Burton Morgan purchased the property, which is south of the Ohio Turnpike and east of state Route 44, in the hope of building an international jetport there. The plan never materialized, but Morgan, along with Harold Morrison, farmed the land until his death in 2003. At that time, the property went to his estate, which was divided equally between the two foundations. 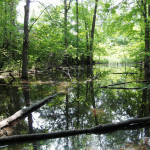 The foundations worked with the Land Conservancy and the park district to provide the public and philanthropic funding needed to create the new preserve. 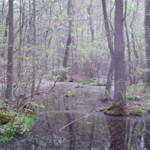 The property is home to several rare and endangered species, including the Yellow-bellied Sapsucker, Hermit Thrush and Least Flycatcher, to name a few. 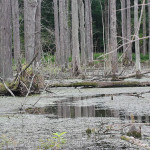 The vernal pools, wetlands, woods and fields also protect 8,000 linear feet of a tributary to the Upper Cuyahoga River. For more information about the Portage Park District, call (330) 297-7728 or visit www.portageparkdistrict.org.